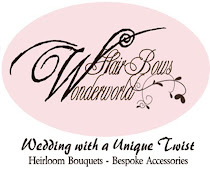 hairbowswonderworld: Christmas is on the way! Christmas will be at our doors before we realise that! I started to have that warm, wonderful feeling I always feel this season. 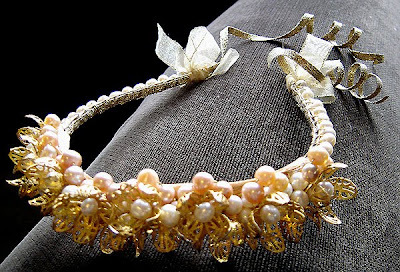 With that in my heart, I created this tiara, may be for a christmas bride :-) ???! My fingers hurt a lot after 5 hours working with it, but I love how it turned out. 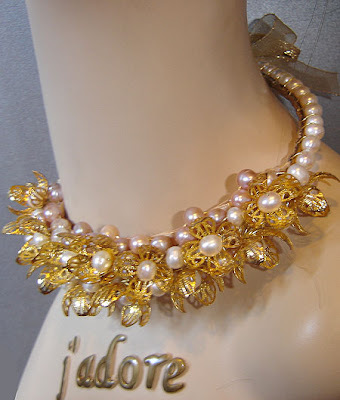 Almosts 150 fresh water pearls are handwired to a metallic gold alice band, together with 4-petal filligree flowers in a warm colour combination of gold, ivory and champagne/light gold. I just love the filligree flowers despite they made my fingers hurt the most while making them from filligree beads. 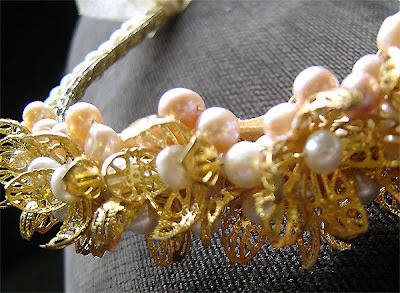 The inside of the tiara is lined with gold satin ribbon and gold metallic ribbon for a comfortable wear. I leaf two strands of curly metallic ribbon at the two ends, so they can be tied behind the neck. Two gold sheer ribbon bows are also added for a final touch. 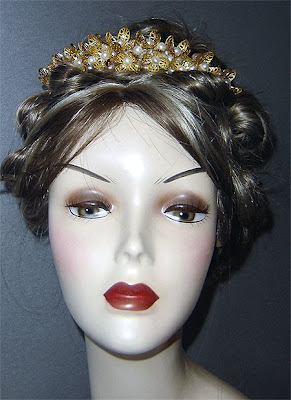 This can be worn as a tiara, and I think it'll look great with or without a veil. A gold birdcage veil will match perfectly - If you want it custom made for you, just let me know. It can be worn as a headband, too. 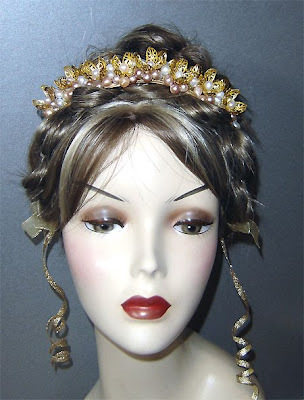 The two curly gold metallic ribbon strands can be tied behind the head or just left freely as extra trim. This can akso be worn as a neck bangle / necklace. Available in my ETSY SHOP. This can also be custom made in off-white/silver.